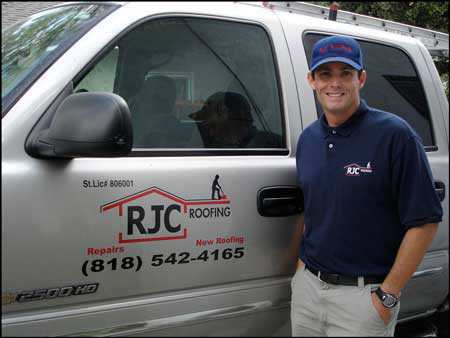 My name is Robert Conaty, owner of RJC Roofing. Our company has been servicing Los Angeles and it’s surrounding communities for over 15 years. Being a small family owned company, our attention to detail is unmatched. Our goal is to provide the up most customer service with knowledgeable qualified tradesmen on every job, large or small. We specialize in all types of residential and commercial roofing materials, including composition shingle, tile, and torchdown flat roof applications. We take great pride in our quality service and treat every roof job as if it was our own. I personally oversee every job we do and can answer any questions you may have before or during your roofing project. From minor repairs to full re-roofs, we will make sure your roof will get done right the first time. All of our work is covered by a full written warranty. Please give us a call and meet me for your free estimate (818) 542-4165. © 2018 RJC Roofing. All Rights Reserved.